NEW YORK (CNN) -- Olympic gold medalist Michael Phelps has acknowledged he engaged in "regrettable" behavior and "demonstrated bad judgment," after a British newspaper published a photograph of the swimmer smoking from a bong. Sports attorney Ryan Smith thinks Michael Phelps should speak to public about his opposition to drug use. 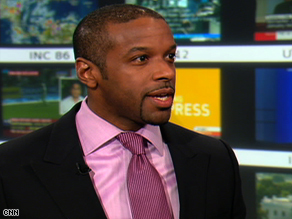 Ryan Smith, a sports attorney and BET talk show host, on Monday spoke to John Roberts on CNN's "American Morning" about how the incident could affect Phelps' career. John Roberts: What was your reaction to news of this picture of Michael Phelps surfacing? Ryan Smith: The thing with Michael Phelps is, he's not only been an outspoken athlete against drugs so he's done a lot of testing, he's been supportive of WADA, which is the World Anti-Doping Agency. But he's really a guy of high character. So you look at this, and my first thought was, "What about his endorsement deals? What's going to happen in those?" A lot of endorsement deals have clauses that say that you can't do bad actions like this, not only crimes, but just things that you do bad in public could result in the termination of your contract. So he could lose a lot of money on this. Roberts: Now he never really admitted to smoking marijuana. ... The United States Olympic Committee isn't going to sanction him, it looks like, but did call his actions disappointing. But to the greater issue that you were talking about, in terms of his endorsement deals, do you think anybody is going to say, well, this is the straw that broke the camel's back with this guy? He had one incident back in 2004. But are you going to dump Michael Phelps because of this picture? Smith: It could happen, and the reason why is because a lot of these companies that are sponsoring him really are focused on kids and how actions of their athletes affect children. So that can be a big problem. The other thing is, unlike an athlete that plays sports every year in the public spotlight, the Olympics for swimmers comes only every four years. So he doesn't have that chance to rehabilitate his image immediately like a lot of other athletes, a basketball player or a football player would. So companies might say, you know what, let's not work with Michael Phelps right now, because he doesn't really have a chance to redeem himself. A picture says a thousand words, and how can he fight that? Roberts: How could you turn this around? If you were his attorney, if you were advising him what would you do? Smith: The first thing I would suggest is a drug test. And I know that that's not required. And I also know that he's not really going to have a problem with swimming in 2012. But I would just show that hey, I'm clean, I'm doing great. The next thing I would do is go out there in the public and talk about the troubles with working with drugs and really show the public that you are not about drug use, you are not about doing bad things in public. You are only about supporting the rules of WADA, the World Anti-Doping Agency, and supporting their drug testing program. So you can show that, hey, this is a minor incident, not a big deal. And really what it's all about is remaining clean. Roberts: If you were to lay a bet, would you say anybody drops him? Smith: I would say he'll have some problems. I don't know if I would say that a big sponsor would drop him, but I would say that a more wholesome-oriented sponsor might.